How bad? Pretty bad. 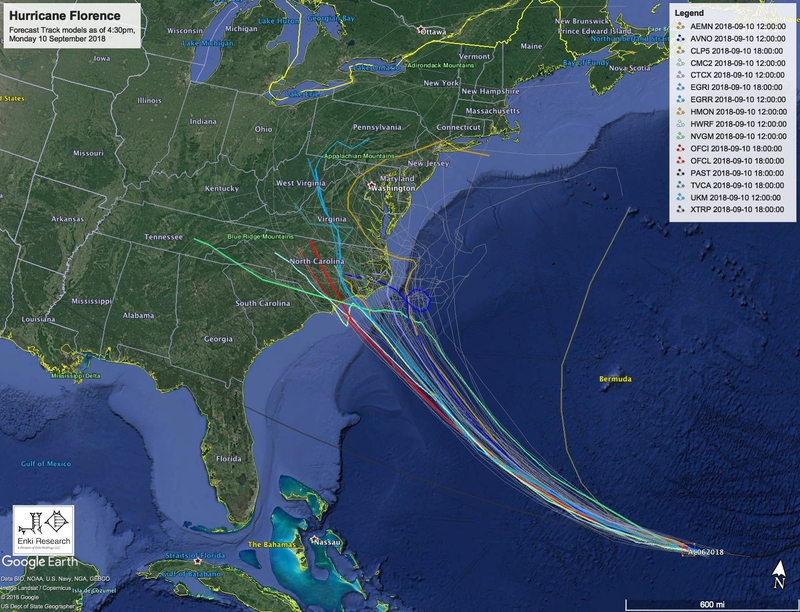 Here’s the forecast damage swath, using the official NHC forecast track. The track didn’t shift that much during the day today, a little bit north, but the broad swath of impacts still covers much of the northeastern corner of South Carolina and all of Eastern North Carolina. Storm surges could easily be in the 25 foot range in places. Damage along the coast will be catastrophic if the intensity holds, with severe damage as far inland as the Research Triangle area. On this track it’s a $20 Billion dollar storm at least, with many estimates coming in at $25 to $30 Billion. As for what to do, this is a seriously bad storm. If you are in on the coast of South Carolina in or north of the Charleston area, or North Carolina, you need to evacuate. It’s a no brainer. Get out, and if inland in a secure structure, button up. If in mobile homes get out even if inland. You really need to listen to local emergency management on this one, hyperbole aside, it is a very dangerous hurricane. WHAT FOLLOWS SHOULD NOT DILUTE THE MESSAGE THAT NORTH OF EDISTO YOU SHOULD FOLLOW EMERGENCY MANAGEMENT AND GET OUT! For the Georgia and far southern SC coast (Beaufort/Hilton Head), the bad impacts will likely all be to the north, and the risk decreases with every hour. This raises an interesting (and tough political) question, given the state boundary between SC and Georgia. The Governor of SC has ordered mandatory evacuations for all zones for the entire coastline. So we have the odd situation where people on Tybee are under no instructions to do anything, while folks across the river who they can literally see are being told to flee for their lives. One of my complaints about the way evacuation decisions are made is that they are often set up as canned responses with little room for flexibility. There are a variety of legal and operational reasons for this beyond the scope of this post. While there is some coordination between the states, most of these decisions are stovepiped, and given the different political considerations in each state, along with different skill levels and experience of personnel, things like this happen. To folks in Georgia, don’t freak out. While you should carefully listen out for a possible change of direction, again the risk is decreasing. 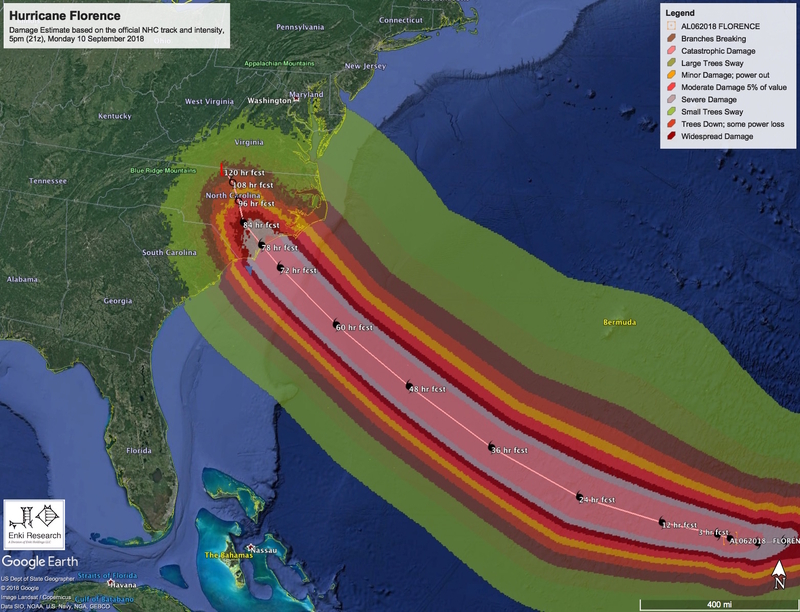 For people in the Hilton Head area, you have a choice to make – follow the directions of your emergency managers, or take a chance, given the odds are likely very much in your favor since it would take a pretty radical change in track to bring life threatening condition to your area? In general I support following the advice of local EMA’s. Here, I personally think a more targeted approach would have been appropriate. I can absolutely see getting ready to evacuate special needs populations, etc. I can see putting the communities on notice. But a general evacuation carries risks – evacuating Sun City and HHI will very possibly kill some people due to stress, traffic accidents, etc. It risks clogging up the roads and taking up hotel and shelter space for people who absolutely must get out of the way. Unfortunately, this is a discussion that tends not to happen until a storm is “barreling” into the coastline, and it devolves in to a “follow evacuation orders or die” kind of thing. We need to have a nuanced discussion about this, and some better planning and coordination at the *national* level. That said, the bottom line is that EMA’s are often a bit conservative, and sometimes have operational, political, and legal considerations that aren’t always in the best interests of every individual, but for the most part they are trying their best and deserve your respect and attention. In this case in the far southern counties of SC (Beaufort, Jasper) those other factors might be in play.